Put Super Glue on something and been too slow to stick it together and ended up having to use more to get the job done. Tried to use Super Glue only to get it on the wrong item or area and had to rush to wash it off before it hardened. Picked up a tube of Super Glue you’ve had for a while only to discover that it has hardened in the tube and is now useless. 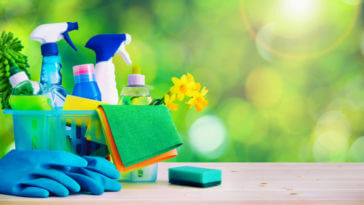 If any of those things sound familiar, then you might be wondering whether there’s a better, more efficient way to repair items in your home. One product that claims to have the answer is Bondic® – but does it really do what the manufacturer says it does? 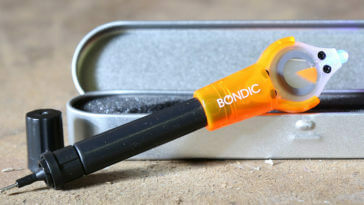 In this review, we’ll explain what Bondic® is, how it works, and how it compares to Super Glue. 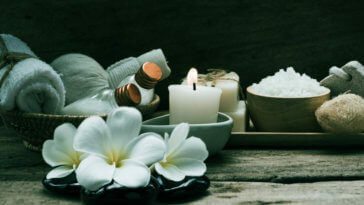 We’ll also tell you what customers have to say about it, reveal the pros and cons as we see them, and at the end, make a recommendation about whether Bondic® is a product you should buy. Before we talk about what Bondic® is, let’s talk about what it’s not. Bondic® is not glue. That might surprise you, since you can use it to do everything that glue can do and more. Bondic® is actually plastic that’s in a stable, liquid form. 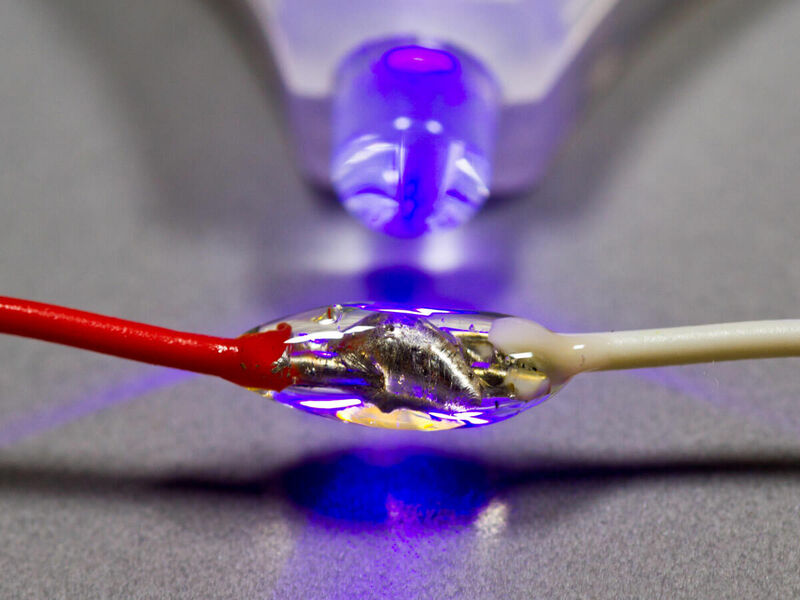 It comes in a tube that looks a lot like a glue tube, but there are some important differences – mainly that it includes a UV light. We will explain how that works in the next section. The fact that Bondic® is not glue means that it will work in some places and conditions that glue won’t. In other words, it’s a fix-all in a tube. One of the creators of Bondic® is a dentist – and Bondic® is similar to the bonds that dentists use on their patients. 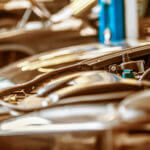 Clean the item you will be repairing with Bondic®. Bondic® works best on a clean surface. Apply the proper number of drops of Bondic® to the item being repaired. Something small, like a pair of glasses, may require only a drop or two. Larger items may require more than one tube. 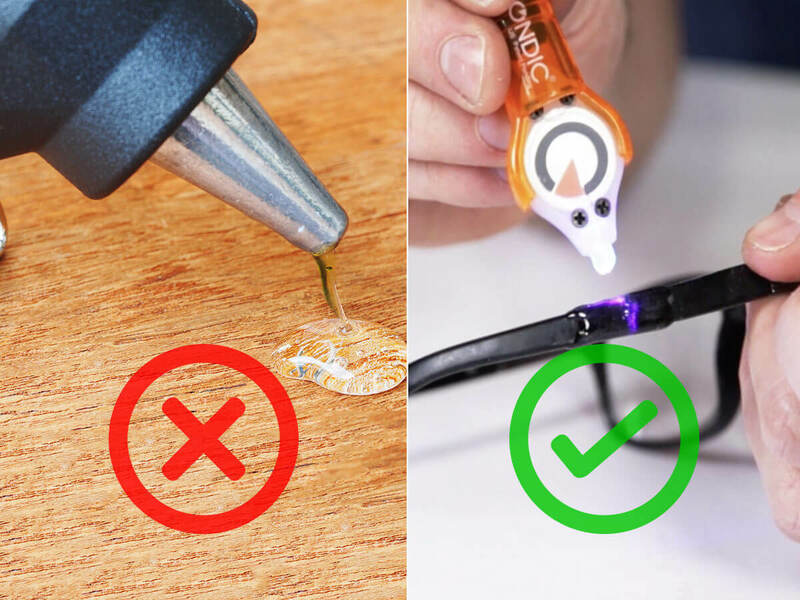 Once the Bondic® is where you want it, shine the UV light at the end of the applicator on the Bondic® for a few seconds to cure it. When it’s dry, Bondic® turns into a hard, durable, clear plastic. Shape or paint the dried Bondic® as you please. Once dried, Bondic® can be sanded, painted, or trimmed. 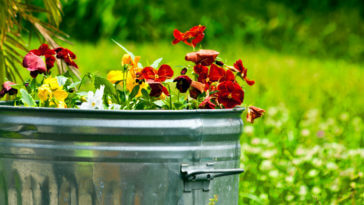 That means that your finished project won’t be left with unsightly blobs of plastic on it. The thing that makes Bondic® preferable to glue is that it won’t try until you set it with the UV light. While it is still weight, you can easily wipe it off of any surface. The manufacturer recommends using a natural solvent to remove it. Where and How Can You Use Bondic®? 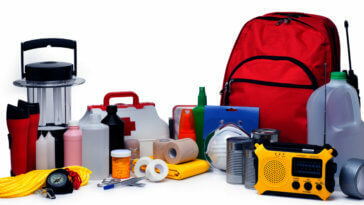 You can use Bondic® on a wide variety of household items and for almost any repair you can think of. Because it isn’t glue, it’s possible to use Bondic® in places and conditions where glue would not work. For example, you can use Bondic® to make underwater repairs. 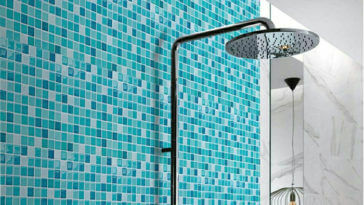 One of the things that stood out to us is that you can use Bondic® on glass. Using Super Glue on glass isn’t an option. Bondic® allows you to make perfect repairs and fill cracks – something you definitely couldn’t do with glue. The key is to ensure that you prepare the surface properly – something that you can learn from the instructions included with Bondic®. What Do You Get When You Order Bondic®? Orders of Bondic® are called “kits,” but let’s explain what that means. 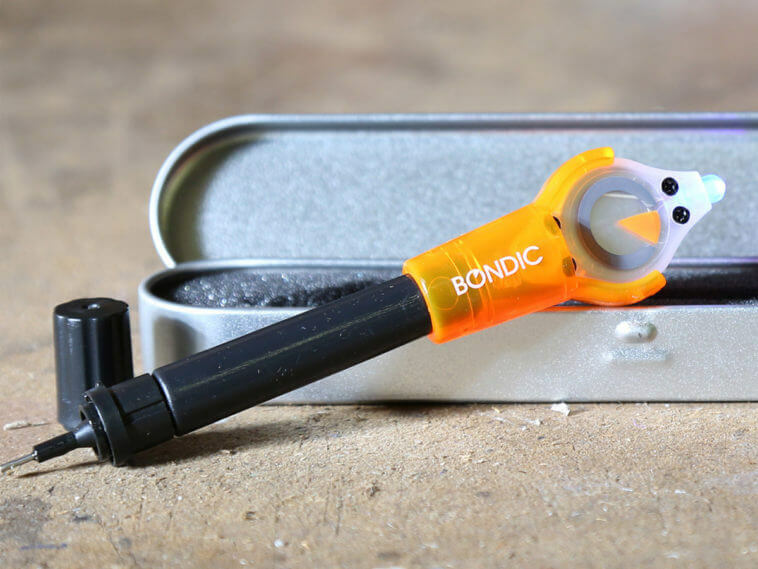 If you order a single tube of Bondic®, you’ll get the tube – which includes the built-in UV light at the tip – in a handy case. The case is silver with rounded ends and has a foam interior to hold each Bondic® pen in place. You should know that each Bondic® pen contains about 80 drops of Bondic®. 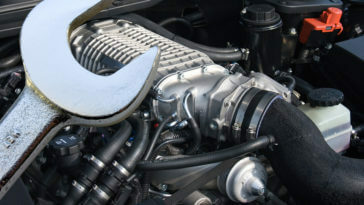 As we stated above, smaller items will probably need only a few drops of Bondic® to be repaired. Larger items – the example they use on their website is a bookcase – may require one or more tubes of Bondic® to be repaired. Later on, we’ll tell you about the discounts that are available if you decide to order more than one Bondic® kit at a time. How Does Bondic® Compare to Super Glue? At the beginning of this review, we ran through some of the frustrations involved with using Super Glue to make repairs. Now, let’s make a direct comparison of Bondic® and Super Glue. Bondic® can be used on glass, PVC pipe, Kevlar, and other surfaces where Super Glue doesn’t work. Super Glue can only be used on dry surfaces, while Bondic® can be used on leaky pipes and can even be used to make underwater repairs. Super Glue dries very quickly and is difficult to remove. You have no control over when it dries. 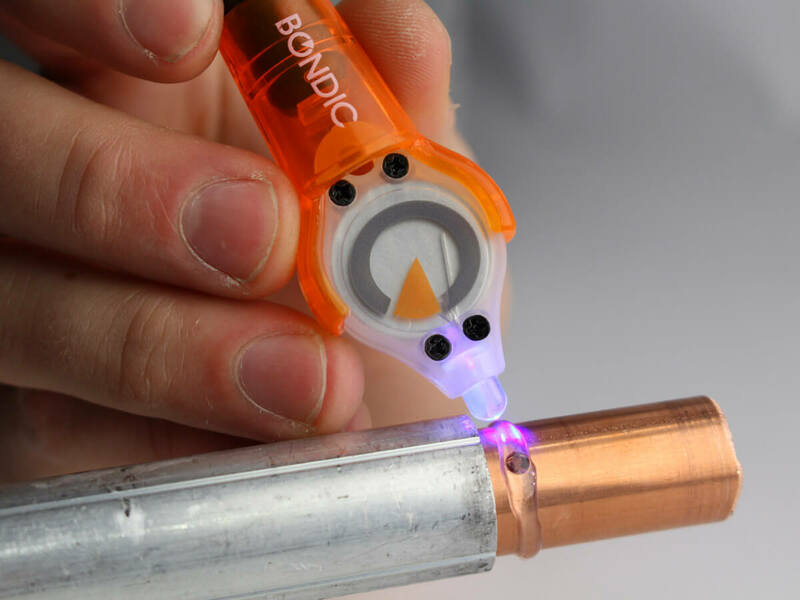 Bondic® only dries when you apply the UV light at the end of the pen to the liquid plastic. You can leave it in place for hours or even days, and cure it only when you’re ready. Super Glue dries when exposed to oxygen. As a result, it can dry out and harden in the tube, rendering it useless. By contrast, Bondic® will not dry out in the pen even if you leave it on your shelf for years. It hardens only when exposed to the UV light on the pen. After it’s dry, Bondic® can be shaped, sanded, and even painted for a perfect finish. The same cannot be said of Super Glue. 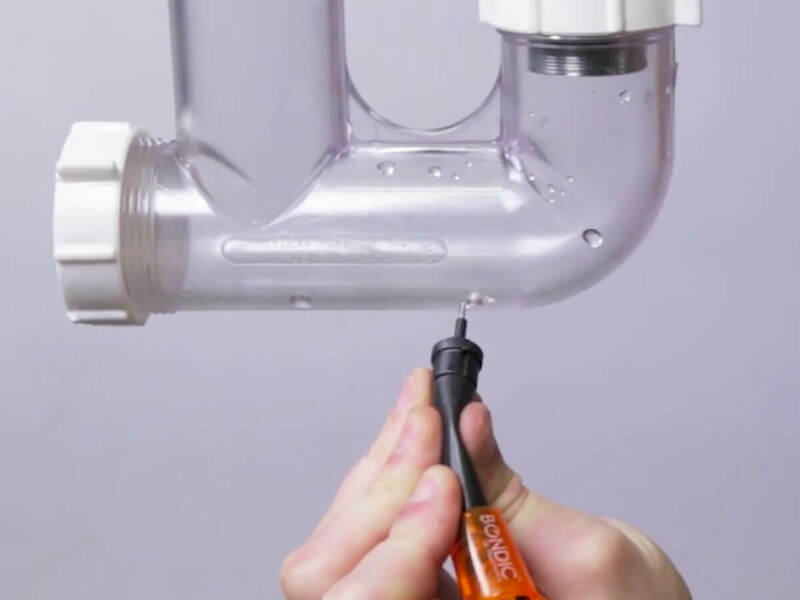 A tube of Super Glue is less expensive than a Bondic® kit, but you will likely end up needing to replace your Super Glue before the tube is empty. As you can see, the only category where Super Glue beats out Bondic® is in price – and even that is questionable since a Bondic® pen will last far longer than a tube of Super Glue. What Are the Pros and Cons of Bondic®? Bondic® is versatile and can be used on virtually any surface to repair, bond, or fill it. It can be used on leaky pipes and even to make underwater repairs. It will only dry when you shine the UV light at the end of the pen on it, making it easy to apply properly and clean up if necessary. Bondic® lasts on the shelf and will not dry up like glue. 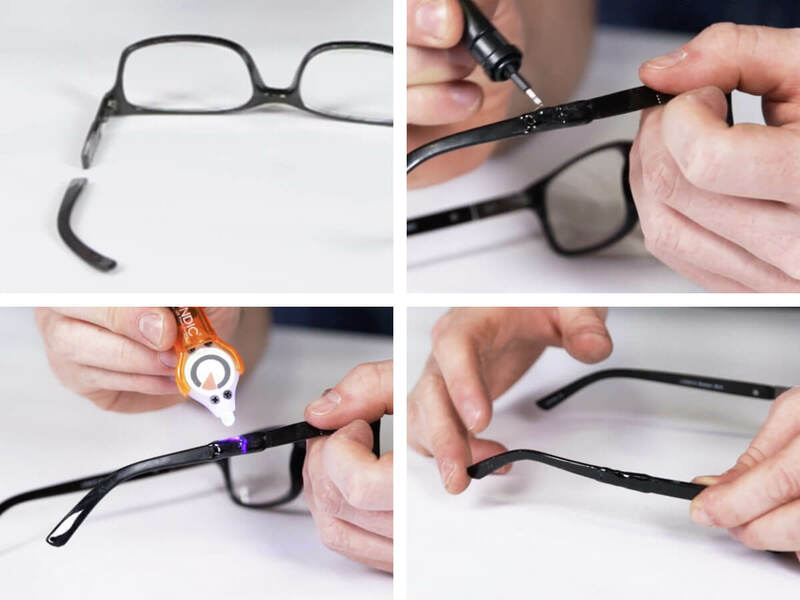 It can help you repair and “rescue” items that can’t be repaired with glue. It is completely non-toxic and safe to use. Bondic® must be exposed to UV light to dry. That means that in some cases, it may not be ideal if you need to stick to large halves of something back together. 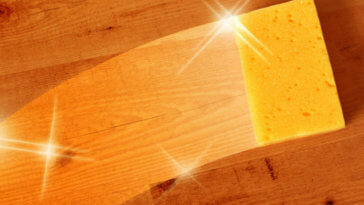 You’ll need to apply Bondic® around the edges to get it to dry. Not ideal for use on rubber or waxy plastics. 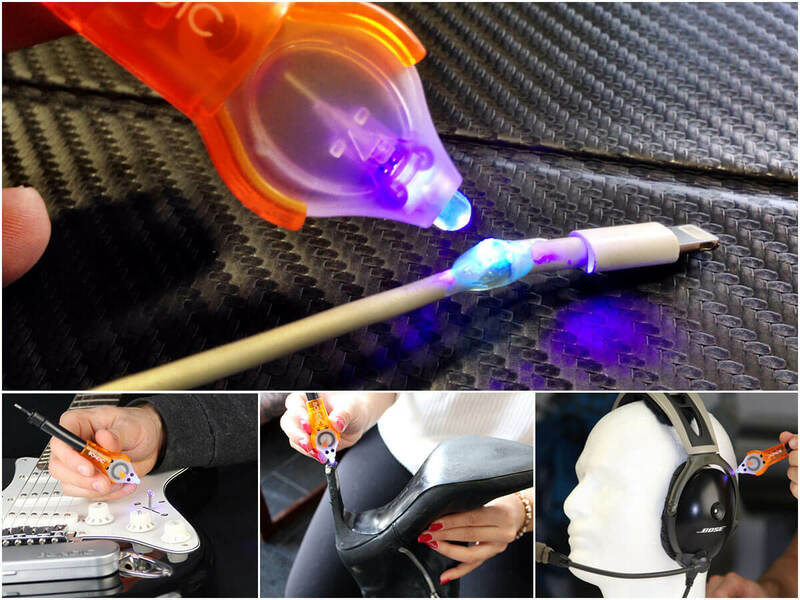 Some customers said that the product leaked in shipping, although the company has excellent customer service and you can simply call for a replacement. Bondic® is more expensive than glue. Our conclusion here is that the pros of Bondic® outweigh the cons. While it does take some getting used to, this is a product that offers a lot and can be a versatile addition to your repair supplies. How Much Does Bondic® Cost? By now, you are probably curious about how much you’ll need to pay to get some Bondic® and try it for yourself. As we mentioned earlier, Bondic® is more expensive than most glues. 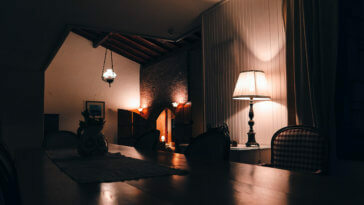 However, its versatility goes a long way toward justifying the price. You should also know that you’ll pay shipping and handling charges if you order only one Bondic® kit. If you decide to take advantage of the bulk offers, the company waives the shipping charge. Bondic® has a 30-day return policy. If you’re unsatisfied with your order, you must contact the company for an RMA number. You’ll be responsible for return shipping charges. Our final recommendation is that Bondic® is a product that is definitely worth trying, especially if you’re someone who does a lot of repair work around your home. In many instances, Bondic® is superior to glue and can be used on a wide variety of surfaces. 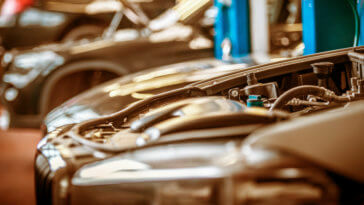 FIXD Review – Can It Help You Diagnose Problems with Your Car?